The Image here shows you the Tabs that appear on all systems. These are the home page, the recent entries, the calendar and the reports. From the drop down list, select the Module that you want to appear as the first Tab (on the far left of the Site). 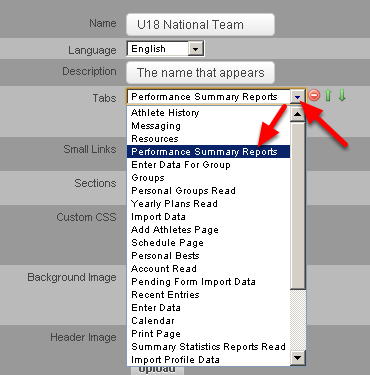 The example here shows that "Performance Summary Reports" was selected to appear in the first Tab. Add in the Tabs as you require on the Tabs List. 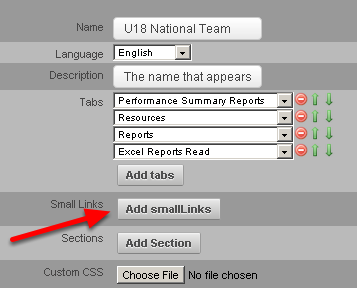 Click on the Add tabs link to add in a new Tab and then select from the drop down list. 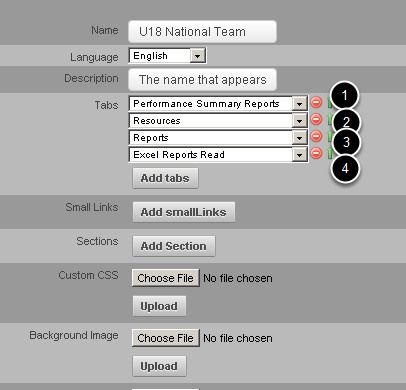 Choose the Tabs that you think the professionals or athletes require. 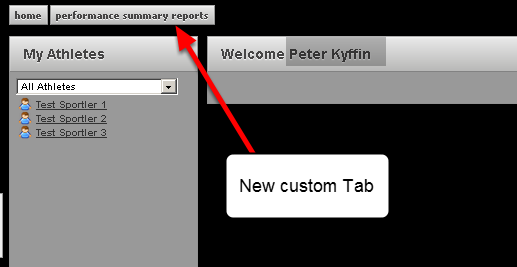 The example here shows that four Modules have been selected to show as Tabs. Aim for 4-5 Tabs to ensure the page does not look to cluttered. You can move the Tabs up or down using the green up and down arrows and this will change their order on the site. To delete a Tab, click on the red delete button. The "home" Tab (home page) always displays so users can get back to the home page. Any of the modules you have selected will appear along the top of the site as Tabs. As you can see here, the four Modules select in the previous step appear along the top of the site. WARNING: You can add in as many Tabs you like, just be careful not to set up too many. If you choose to have this many they will wrap into a second line (as shown in the image here). 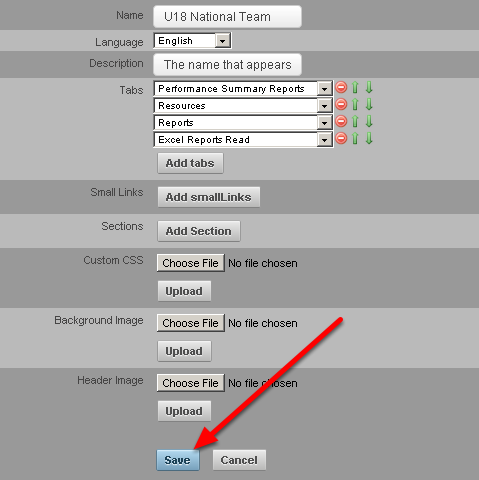 Once you have added in the Tabs that you require click on "Save" to save these settings (you will need to click "Save" twice if you have just set this Page Layout up). If you save the layout this will protect against loss of the page layout in case you have an internet outage while you are in the middle of creating it. Once you Save the Page Layout you can open it again from the Page Layout list by clicking on it. Now set up the Small Links. See the Next Lesson for information on how to do this.